If you’re a first-time home buyer or this is your tenth time purchasing a home, there are some things that you need to know to make sure your transaction is handled correctly and all your needs are being met. Warner Robins real estate buyers should always have a buyer’s agent when purchasing a property. Most home buyers don’t realize that buyer’s agents are completely free to the buyer. These agents receive half of the commission from which ever home the buyers choose. None of the commission actually comes out of the buyer’s pocket UNLESS the home is a For-Sale-By-Owner and the owner does not agree to pay the brokers commission. A buyer’s agent is completely dedicated to finding the right home at the right price for their buyers without the urgency to sell any specific home. As your Warner Robins Realtor® it is my duty and privilege to help you find a home you love in a price range you can afford. We keep all of your financial and negotiating strategies confidential and work on your behalf to get you the best price and the best terms. All parties involved really want to make this work for you. There are no less than five different companies and parties involved in a real estate transaction; from the agents, to the sellers, to the escrow and title people, not to mention lenders and underwriters, all working together to make sure that this real estate transaction is the right deal for you and closes on time. You can help make this process as easy and smooth as possible by making sure all documents are signed on time and answers are provided for lenders and escrow agents when needed. 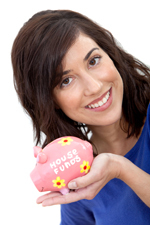 It helps to have a reserve fund when purchasing a home. Although you can still buy a home with zero or very little money down, it helps to have a reserve fund when purchasing a home for out-of-pocket expenses such as inspection costs and earnest money. Inspection costs are anywhere from $200-$800 and earnest money secures your offer on the home and can be anywhere from $500 to 3% or more of the purchase price of the house. It also helps to have this reserve fund to prove to lenders that you have a little liquid cash for any surprise impending costs. If you’re ready to begin your search for all Warner Robins real estate, contact me anytime. I love helping first-time homebuyers and those looking to purchase in our area find the right Warner Robins home at the right price. (478) 960-8055.